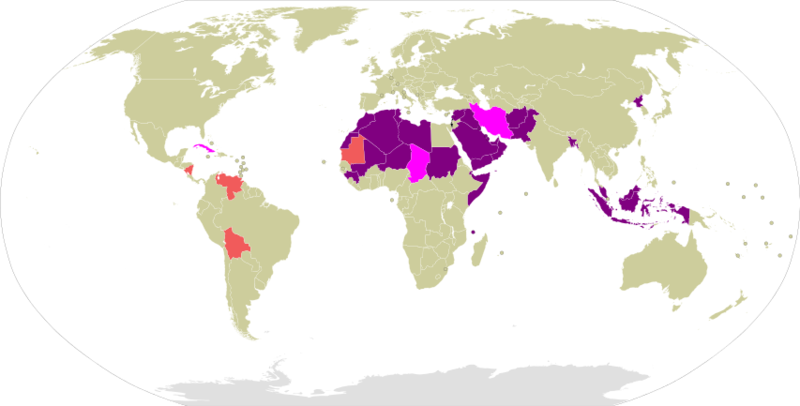 The countries that banned the passport have done so for a reason. They are aware of the atrocities committed by the Israel Defence Force and have seen Palestinians being displaced from their homes for the illegal settlements. I know that motivation questions aren't allowed, so rather than trying to look at motivations, I'll look at dates - whether the purported cause occurred before the effect. I've done some searching, but while there's plenty of articles mentioning the ban on Israelis, I haven't found so far mention of when the bans started. Did the ban on Israelis postdate the construction of Israeli settlements which involved Palestinians being displaced? Therefore the claim is false: Iran severed relations for unrelated reasons and the other three countries still admit Israeli passports. The Arab League announced a policy of boycotting Israel (or rather the Jewish residents and organizations of Palestine) in 1945. The passport issue is an extension of this boycott. There were local boycotts beginning in the 1920s. At this point, all Jewish controlled land in Palestine was bought from Arab landowners and there were no "settlements" of the sort that is now described as "illegal settlements"
There is an Arab landlord with Arab peasants working his land. When he sells his land, the Jews want to work the land themselves and don't renew the peasants' tenancies and they lose their jobs. This pissed off Arab nationalists like Qassam and was one of the causes of the 1936 Palestine riots. Summary: Boycott began in 1945. Jewish settlement (lower case) displaced Arabs before 1945, but there were no Jewish Settlements (Upper Case) yet. Not the answer you're looking for? Browse other questions tagged immigration israel . Do Israeli soldiers kill Palestinian kids? Did the IDF inflate the numbers of rocket casualties? Are Indians immune to Israeli stink bombs?